In the upcoming week, I am once again traveling to London for a couple of days. As you may have read in our London Travel Guide, I am absolutely in love with this city and I will take any chance I get to go there. This time I'll be going for three days. I'll be traveling with a friend and we will be staying in a hostel. I've never stayed in a hostel before, so I'm very excited to give that a try and to give you an update afterwards (if you'd like that of course). We'll also go and visit the Harry Potter Studios, which I'm very much looking forward to (huge Potterhead over here). My friend has only been to London once before when he was very young, so we'll also have to go and do some sightseeing while we're there as well. Oh, and some shopping of course! Keeping all this in mind I started packing and while I was doing so a thought occurred to me. Why not give you a look in to what I'm taking with me on a citytrip and share some of my traveling hacks with you guys? I like reading (and watching) stuff like this myself, so I thought you might enjoy it as well! There are some little tricks for packing my stuff, that I stick to religiously. First of all, about a week before I leave, I get myself a Post-It and put it on my laptop (but you could also just use the Notes-app in your phone). Every time I think of something that I shouldn't forget, I write it down, 'cause I guarantee you, those are the things you are most likely to forget when you start packing before you leave. Second, check the local weather report. This one really is just common sense. When you know what kind of weather it's going to be, it's so much easier to choose what clothes you are going to take. And lastly, lay everything you are taking with you out on the bed (or any other surface area for that matter) before putting it in the bag. This will give you a better overview of what you're taking, whether you're missing something, if you're taking unnecessary stuff (you really don't need clothes for a week when you are only going on holiday for a weekend), etc. It'll also help you pack your bag more efficiently, since you're not just stuffing everything in there all willy nilly but you can actually pack your bag kind of structured (heavy stuff at the bottom, things you'll need first at the top,...). Now that we've gotten the general stuff out of the way, let's see what I'm actually taking with me on this trip. Let's start with the smallest, but also the messiest and the most filled-up bag of the bunch, my make-up bag. To start packing this one I first had to clean it out, and boy oh boy did a lot of sh*t come out! I discovered that I had about 20 liquid lipsticks in there, all in the same color range, that I hadn't worn in months. Why?! After I had completely emptied out this bag, which I got from Primark a couple of years ago (they still sell similar ones though), it was time to start filling it up again. I wanted to get all my makeup AND all my toiletries in this one bag, just to save some space in my suitcase, so I really had to cut down on what I was taking. Luckily, I still had a lot of travel-size and sample-size products from my Kiehl's Advent Calendar lying around, which meant I didn't have to take any of my full-size skincare products. Mind you, I don't normally take full-size products with me, even when I don't have any travel-size products. Here's a little travel hack for you guys: You know those little sample pots you get at Lush and The Body Shop (and maybe some other stores as well)? Don't throw them away once you've used up the product but rinse them out and save them for when you go traveling. I just transfer some of my skincare products into the little pots and take those instead. No unnecessary lugging around of those full-size products and less risk of something spilling in your bag as well. I transfer some of my skincare products into these little sample pots you get at Lush, so I don't have to take any full-size products with me when travelling. If you want to remember what you put in each little pot, just put a little piece of tape on the top and write what is in the little pot on there. Or you could even just take some samples if you have some lying around as well! I took two foundations with me, one that's a little more full-coverage (L'Oréal Accord Parfait Foundation) and another one that's gives a more sheer coverage (Make Up For Ever Mat Velvet+). Maybelline Total Temptation Mascara. I've been using this mascara for a few weeks and I really like it! It's lengthening and volumizing, without being clumpy or spidery. And it smells like coconuts! I decided to take the Too Faced All Natural Palette. It's a versatile palette, that pretty much has every color eyeshadow I could possibly need. It also has a big mirror which might come in handy when travelling. Kiehl's Calendula Deep Cleansing Foaming Face Wash. This is a travel-size product that came in my Kiehl's Advent Calendar. It's perfect for normal to oily skin. Kiehl's Ultra Facial Oil-Free Gel Cream. Another travel-size goodie from the Advent Calendar. I do use this moisturizer on a day to day basis as well, so I already know I like this one. Kiehl's Creamy Under Eye Treatment with Avocado. I took the full-size tub of me with this since it's really not that big. Kiehl's Calendula Herbal Extract Alcohol-Free Toner. Another travel-size product. I've used this one a couple of times and really like what it does to my skin and since I had this travel-size lying around I decided to take it with me. I'm still using my natural crystal deodorant and I still love it. If you want to read more about this, we have an entire blogpost dedicated to it over here. I don't wanna have to wash and dry my hair every single day when I'm on vacation. So I took this Colab Dry Shampoo for when my hair starts getting a little greasy. As I already mentioned, we are staying in a hostel. In this hostel, each guest gets a locker to put their bag in when they are out exploring the city. However the space in these lockers is limited, so I had to keep that in mind when picking out which suitcase is was going to take with me. I chose this duffel bag, that isn't too large, but still has space for all of my stuff and then some for all the stuff I might buy in London. It also has wheels on it which will come in handy when we have to walk to the hotel after arriving on the Eurostar at St. Pancras. Some of the stuff I'm taking in my suitcase. As I already mentioned, check the weather report before you start packing, so you don't bring any clothes that aren't suited to the weather and don't overpack. I know it's fun to have a selection of clothes to choose from but it's so much easier if you just think about your outfits ahead of time. Pick out one outfit for each day and maybe one extra outfit just in case, but that's it. I'm guilty of packing way to many clothes myself and it just means you end up with an extra big pile of laundry and creased clothes afterwards. We were expecting cold weather for the three days we were going to be in London, so I made sure to pack some sweaters and to wear a warm coat as well.. I only put my makeup bag into my suitcase right before I leave, since I usually still need to use some of the products in there. I do however make sure it's already packed and ready to go, so that I only need to remember to actually put it in my suitcase. 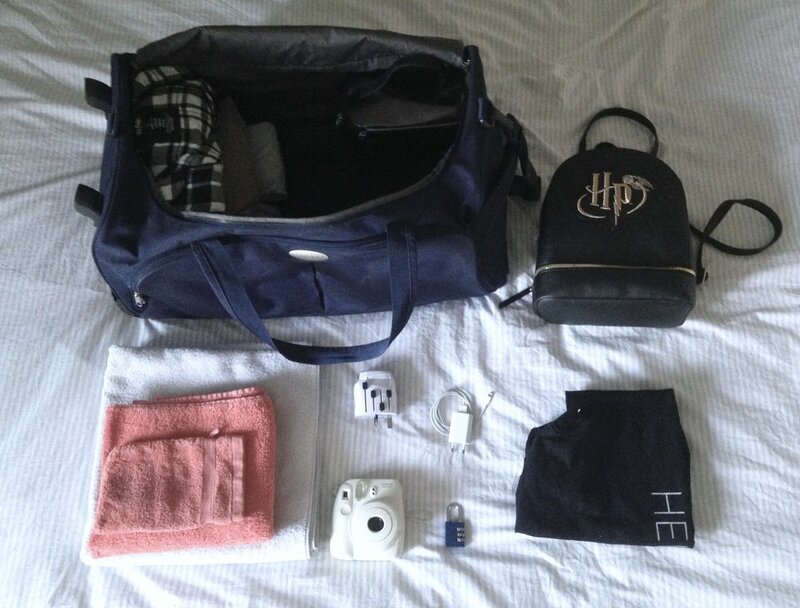 You can't go to Harry Potter World looking like a complete muggle, now can you? One thing to always check when you are traveling abroad is whether the plugs are the same over there as they are in your country. Most of the European main land uses the same kind of plugs, but the plugs over in the UK are different, as are the plugs used in the US. I usually just put these in my luggage, but you could also put these in your backpack if you'd like. I just know my phone and I know that I can usually go a whole day without needing a charge. The hostel does provide sheets, but it does not provide towels though, so we had to bring these ourselves. This is a little more unusual. The reason I'm taking a padlock with me is that we need one to close up our lockers at the hostel. We could also rent one at the front desk, but why do that when you can take one with you and use that money for something else? This is one of those things that I would definitely forget if I didn't write it down. Is it absolutely necessary? No. Is it convenient as hell? You bet it is! I just take whatever tote bag I have lying around and use that as my laundry bag. This time it just happened to be one from an Adele concert I went to last year. My beautiful Michael Kors backpack, which I'm taking with me instead of a purse. I was thinking about taking a purse with me at first, but once I started thinking about our itinerary (and how packed it was), I decided against it and went with a backpack instead. When writing this down, it also occurred to me that I hadn't even told you about my new backpack yet. My mom bought me this gorgeous light-grey Michael Kors backpack for Christmas (thank you mommy!). I love the simple, yet classic and sophisticated look of it. It also packs a lot more stuff than you would think. I didn't own any bag in this soft-grey before this one either, and I really don't know why since I really love the color of it! So yes, I was very very happy when I opened up this package on Christmas Eve, in case that wasn't completely clear by now ;). Since we wouldn't be able to go up to our room before 2.30pm I decided it would be best to really only pack the essentials into this bag, since anything I put in it, I would be carrying with me, at least till 2.30pm. The weather forecast told me it was gonna be quite cold in London during the days we were there, so I decided it was best to come prepared and just take a pair of gloves me, just to be sure. 'Cause, duh. Another little tip: Before you leave, clear out your entire wallet and only take the truly necessary stuff in there. The only thing that can come from you taking unnecessary stuff in your wallet is that you either lose is or it gets stolen. So why take the risk? I literally only take my ID, cards (credit/debit cards and my Oyster card when I'm going to London) and some cash with me in my wallet when I travel. Sometimes I'll also take my driver's license, but only when I know I'm going to need it though! I had this map lying around from a previous trip to London. It has a little map of the underground on it as well and folds up really small. It's not that detailed, but it's just a good idea to take one of these with you when you're discovering a city, to get a general idea of where you are. If you really should get lost, just ask a local, I promise you, they won't bite! I usually take a book with me to read on the way. I do however try and put it in my big suitcase when dropping off our luggage at the hotel (most hotels/hostels will store your luggage when you arrive before you check-in time), cause I really don't want to be lugging that around with me for the rest of the day! I'm taking the YSL Volupté Tint-In-Balm with me since it's a lipstick and a lipbalm all in one. The London tube really isn't the most hygienic place in the world, so I always take some hand sanitizer with me for when I use the underground. Also, it's currently flu season and nothing as inconvenient as getting sick while on vacation. I think that's about it, that's all I'm taking with me on a citytrip. I'm not completely happy with how some of the pictures turned out, but practice makes perfect, right? I'll just have to write some more blogpost and take some more pictures to get them on point ;). Let me know if you like this kind of blogpost and if you would like me to write another one when I go to Montana (USA) at the end of the month. I'm going there for 3 weeks, for an internship at a veterinary clinic, so I'll be taking very different things on that trip. Also it's quite cold there so I'll have to take that into account as well when packing for that trip. So, let me know your thoughts on that as well please!